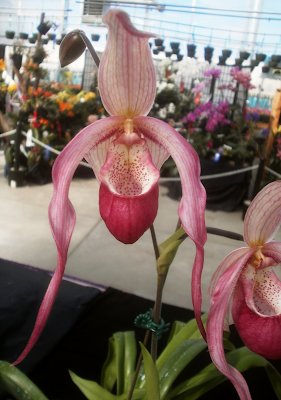 According to my notes, this is the only "long droopy phrag" I took pictures of at the show. 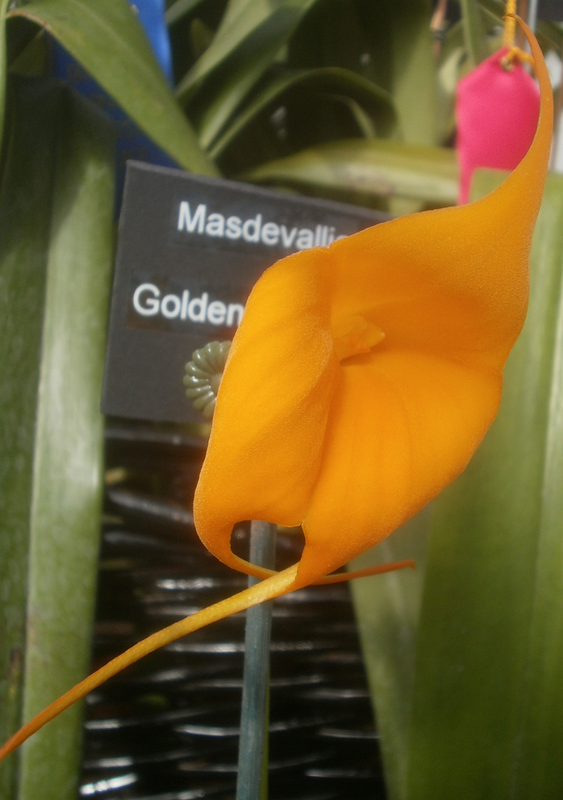 Part of this is because I was trying not to take paph and phrag pictures, because when I do it just leaves me depressed that I can't grow them, and part of it is because the photos don't turn out that well for me, a lot of the time. Though this one actually looks pretty decent, considering. Not the best picture but at least reasonably color-accurate, I think. I just couldn't bring myself to oil Anthuriums this week, either. So that's what, like three consecutive weeks of oiling, followed by two weeks of not-oiling? 1) I saw thrips again on Thursday (4 Sep.). Also saw 2 scale insects on one of the Agave victoriae-reginaes in the basement, on 3 September. It is unclear whether the insects in question were alive at the time, but even seeing dead ones isn't a happy occasion: I want to not see them at all. 2) A lot of the plants are sticky, too, from dried oil and dishwashing liquid. It'll wash off eventually, I assume, but it makes dealing with them slightly less pleasant until that happens. 3) I also suspect that some of the bud-dropping I've been seeing lately with the Anthuriums can be blamed on the oil. 4) And we did wind up losing #238 "Rudy Day," #247 "Selma Carr," and #243 "Sal Monella," most obviously from watering issues, but it's possible that the oil didn't help. #095 "Clarice Fulhartz" is still around, at least, and may live long enough to produce a bloom, though she doesn't seem to have produced any roots yet. 5) Even though it hasn't actually eliminated the thrips or scale, makes the plants unpleasantly sticky, may be killing buds or plants, and has an unpleasant smell, I think I'm still going to resume oiling this week. It did, if nothing else, make the thrips a lot harder to find, and it's possible that if I'd just kept it up for a couple more weeks, I might have actually gotten rid of them. I mean, it may not be likely. But it's possible, and I'm otherwise out of options. So.